The intro paragraph Catherine has been billed on Metacritic.com as an action/adventure title, which is about as accurate as describing Donnie Darko as a film about a teenager. Make no mistake: you won't play another game like Catherine all year. Catherine tells the story of Vincent, a 30-something sad sack who has been dating his girlfriend, Katherine, for around five years. At lunch one day, she hits him with the one-two punch declaration that 1) she doesn't feel like their relationship is moving forward and 2) she likes the idea of getting married. This sends Vincent staggering to his local bar where he promptly gets drunk with his friends. While intoxicated, he meets a vivacious, free-spirited minx named Catherine, who seems to share his phobia about long-term commitments. The next morning, Vincent wakes to find that he and Catherine have had a one-night stand. As bad as all this sounds for Vincent, it pales in comparison next to the revelation he makes later, in which he learns that men in his neighbourhood are dying in their sleep. This is of particular interest to him, since he's started having horrendous nightmares in which manifestations of his real-world concerns chase him up crumbling towers, threatening to dismember him. The knife-twist comes when figures in his dreams start reminding him of acquaintances he's made while awake – and those acquaintances start turning up dead. While these nightmares weigh heavily on the mind of Vincent, they're a boon for the player, because they constitute the lion's share of the gameplay. The most challenging stages of the game involve the player having to create makeshift staircases out of towers of movable blocks, while racing against the clock. The difficulty level of these puzzles is pretty hard throughout – even on the easiest setting – and is compounded by shonky controls and a driving orchestral score that frequently sends the player's tension levels into control-pad-smashing territory. 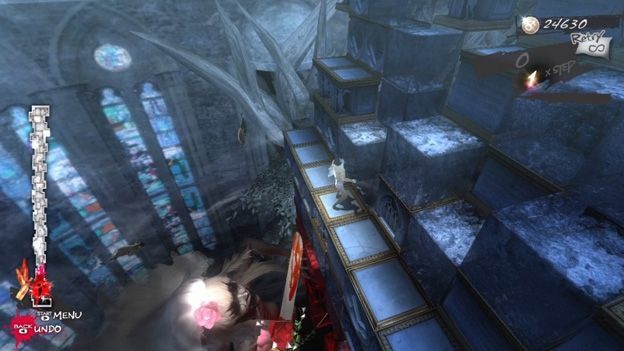 That having been said, Catherine's puzzle-block nightmare levels offer players capable of conquering them a high that few games can match. Because the game is hard, and because in places it feels unfair, victory is all the more sweet when it's attained. Besides these highs, Catherine takes a hard, unblinking look at romantic ennui, and sticks the player in the driver's seat in how the plot plays out. The game contains multiple endings, which players work towards by interacting with Vincent's friends and acquaintances, answering the odd question about moral values, and ultimately, deciding whether they'd prefer a fling with Catherine, a committed relationship with Katherine, or a clean break from the pair of them. It's rare that a video game bothers to examine an adult relationship in a way that doesn't present the protagonist as either an injured party in search of revenge, or a hero who needs to rescue a damsel in distress. The story of Catherine isn't well written, and its protagonist is more annoying than sympathetic, but anyone who has ever been in a relationship that has stalled will respond to it with a wry, knowing smile.